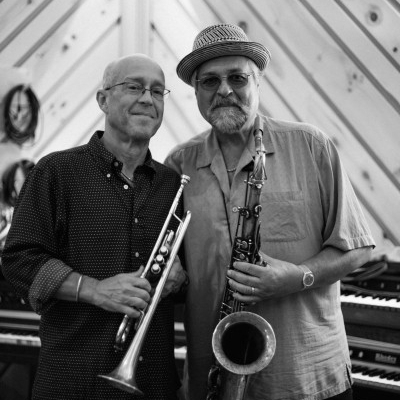 Scandal marks the first time trumpeter Dave Douglas and saxophonist Joe Lovano have recorded a full studio album together as co-leaders. The two crossed paths occasionally for nearly twenty years before forming a group: Douglas was a guest on Lovano’s 2001 Blue Note release, Flights of Fancy: Trio Fascination Edition Two; and their respective tenures with the SFJAZZ Collective overlapped for three seasons, including one devoted to Wayne Shorter’s repertoire. Their quintet, Sound Prints, with pianist Lawrence Fields, bassist Linda May Han Oh and drummer Joey Baron, premiered with Live At The Monterey Jazz Festival (Greenleaf) in 2013, featuring original tunes augmented by two Shorter songs. On Scandal, the group ventures into sophisticated, swinging territory, once again inspired by Shorter’s oeuvre. […] This detailed studio session provides ample opportunity to hear how the co-leaders rapport has developed over the years; Lovano’s gruff, breathy tenor and Douglas’ polished tone makes a complementary pairing of seasoned reeds and brass. The rhythm section is similarly inspired; Oh’s full-bodied bass and Baron’s taut kit work interlock with Field’s melodious pianism, yielding rich interplay. According to Douglas, “The language of our playing has certainly evolved. The whole concept of playing in dialogue, the collective spirit, the sharing of different roles, has grown with each successive concert and tour.” Scandal is proof.